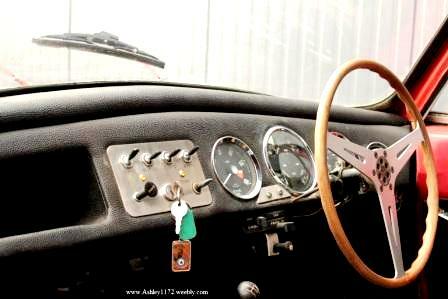 We have just bought an Ashley laminate with an Austin engine. We would like to know what is the chassis of the car. Is it triumph Austin, or is it a Ashley making? We do not find chassis numbers, do you know where we can find it on the car? Do you know building year of the car and the year Ashley worked on it? Which I'm pleased to say he did. and he had bought the car from him. "A strange twist to this story"
29th August 1970 in Enfield, Middlesex. a chap had the bonnet up and seemed to be tinkering with it. The car had been on the road less than a month at the time of this sighting. as an Austin/Triumph, chassis number J 1001. I received an email from Patrice Wattine from France, who was the owner of Ashley 750 - SSK 771 (Click here to see) and has been a keen collector of UK specials over many years. His latest purchase is KPU 61J and he has sent me some new photo's. So if D.J.Jarman, Douglas Rand or Rudy Bouckenooghe see this page please get in contact with me so that we can update it together.